For information about installing The Celtic Knot Font, click here. q e z and c, or Q E Z and C, or ( ) O and P, or L : > and ? Then find pieces that connect between your knot and the corners. When I use this method, I always come up with a knot that I would never have imagined if I had been doing it the old way! The opposite way to create new knots! Start by making a border. Start with the same corner elements that I mentioned in the previous tip, connect the sides using a variety of parts, and gradually fill in the knot. If you find that some of your knot-pieces mysteriously change when you hit the Enter key, your word processor is auto-formatting the text. It may be capitalizing the first letter of a line, inserting smart quotes, adding bullets or icons. Turn off auto-formatting or use a program such as WordPad (Start button> Programs> Accessories) or SimpleText which doesn’t have that feature. Making borders around pages: The Celtic Knot Font is a monospaced font, meaning that all the letters (and the space) take up the same amount of horizontal space. If you make a border and then type inside of it with most other lettering fonts, their uneven letter spacing will change the spacing of the border. If you're using a recent version of MSWord, or a program such as PageMaker, Publisher, Framemaker, etc., you can make a text box within your border and type into that. You can also create the border and the text as separate documents, print one and then put the paper back through to print the other. Some programs like MS Word and MS Publisher will show small spaces between the parts of the knots. Don't let it bother you. It is only on your monitor and the gaps won't show in your prints! If you can't stand seeing these gaps in your knots, do what I do: use WordPad to create and edit your knots. 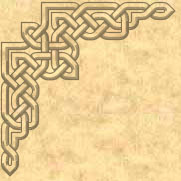 When working in programs such as Photoshop or Illustrator that allow you to adjust “leading“, be sure to set it to the same number as the font size to avoid gaps in your knotwork. Making circular knots: If you have Microsoft Word, you have a tool called Word-Art. It can bend text into shapes including round. After you make the round knotwork (or semi-circular etc.) you can export it and use it in other programs like Photoshop or drawing programs. For Macs, there is a cool program called TypeStyler that not only bends the knotwork into circles but applies textures, shadows, glows and more. Most graphics programs also have text-on-a-path or type-on-a-curve features. 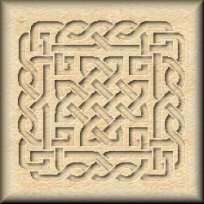 Knotwork designs can easily be transferred to many materials for arts and crafts projects! 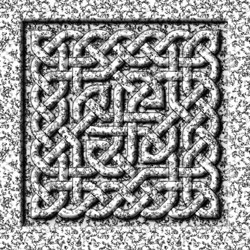 Just print out your knotwork on a laser printer, or use a copy machine to make a copy of an inkjet printout, then place the paper face down on your project (wood, fabric, clay, etc...) and iron with a low setting. Submit your tips and tricks! If you have a cool trick send it to me and I will add it here! You can also use the same technique on wood or any other texture background that you want. Click here to see the Embossed Knot tutorial. Keya of OuttaMyShell Digital Studios has written a wonderful tutorial on how to do knotwork that appears to be carved into wood. 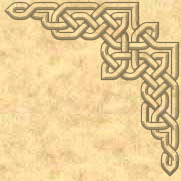 If you would like to share your techniques for making cool graphics with the Celtic Knot Font, we welcome your submissions! If you don't have the Celtic Knot Font yet, click here to order it.